Entity programs include 1120, 1120S, 1065 & 1041. These programs with our 706, 709 & 990 enable a preparer to process, complete and deliver professional returns to their business clients. Mouse-free operation speeds data entry and program navigation. Keep your hands on the keyboard and finish the return quicker. Prior year data is recalled in a single step reducing data entry for returning clients. Summary totals are displayed in convenient locations. 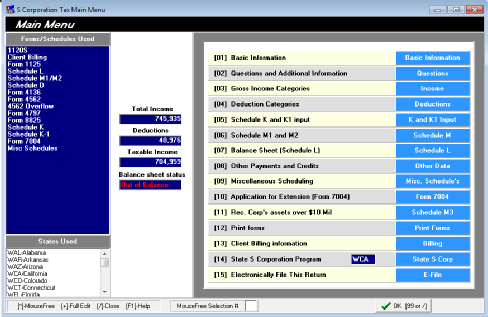 The Entity programs feature a wide range of forms. Many states are offered and are included at no additional cost. Input forms and proformas are also available. 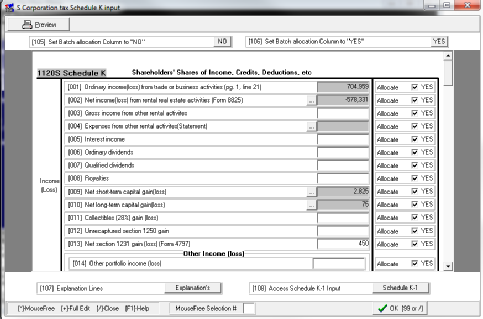 Automatic batch allocation is available in programs with shareholder’s/partner’s statements. K-1 transmittal letters can automatically be printed and reconciliation reports are available. Federal electronic filing is available and very easy to use. Some selected state electronic filing is included with no additional charge. K-1 import to our Wintax 1040 program using the K-1 SSN.